One thing that there’s a whole lot of confusion about these days is bird traps. 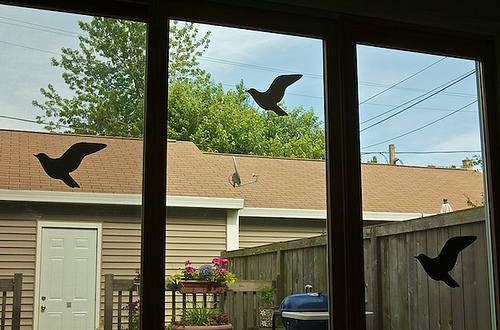 A bird trap is a plastic silhouette of a bird you put on a window, to make sure real birds fly into that window a lot. Some people think that’s not what they’re for, but yeah, it is. These silhouettes of birds successfully flying through a window sends a clear message to all the other birds, saying, “please, fly through this shiny opening.” Of course, if a person wanted to dissuade a bird from flying into their windows, they would put up a silhouette of things that kill birds, like cats, or bigger birds, or Michael Jordan. An easier way to make bird traps than putting plastic silhouettes up is to tape crackers on the insides of your windows and set black paint buckets so they’re just about to tip off your roof. Then when the bird flies to get the cracker the wind from his wings knocks paint onto him just as he’s about to touch the window. Some people say I’m a genius for thinking of this but really it was just Home Alone. Some people argue that just crackers on your windows is already a bird trap and you don’t need paint at all, but I say that’s not a bird trap then, is it? That’s just crackers on your window.